Cross-contamination can lead to anything from a ruined job, to serious health problems for you or others. That’s why it’s important to take time to ensure it doesn’t happen. Proper equipment, like shoe covers, can help you maintain a clean work environment. Cross-contamination is a fancy word for when bacteria or other particles are moved from an uncontrolled area or surface to your workplace. This can be anything from dirt on your clothes sticking to fresh paint and creating an uneven surface, to bacteria riding a surgeon’s shirt into the operating room. At sensitive work sites, cross-contamination can ruin a job. Shoes have a rough job – they protect our feet from all kinds of dangers and messes, from nails to the latest ‘gift’ from the next-door neighbour’s dog. It’s an important job. But it also means that our footwear is one of the worst offenders for cross-contamination. For most work sites we can’t just remove our footwear, because it’s still doing its most important job on the worksite – protecting our feet. There are, however ways to work around this nuisance, even if you don’t have time to constantly switch shoes as you move from work site to work site. 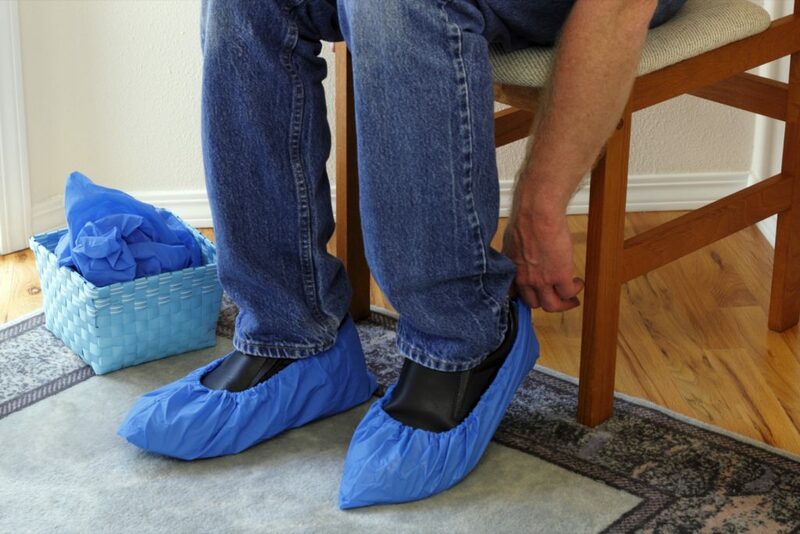 Shoe covers offer a simple, cheap solution to cross-contamination via the soles of our boots. Shoe covers come in a variety of types, including disposable or more robust, reusable ones. With the proper shoe covers for your job you can stop cross-contamination from ruining the job, or someone’s health. At Colony Distributors, we carry an array of shoe covers. Whatever your job, we can help find the cover that is right for you. Give us a call today and find out what your options are!